Tag Archives: What task comes next in Family Guy Game? The Blimp is FINALLY ready to travel! With the introduction of the Blimp District, The Fine Arts District, TinyCo has finally unlocked the keys to the blimp and time travel is upon us! Well…upon Stewie and Vinny, we just get to watch the blimp disappear and come back. Anywho…a new district means all new questlines! Once again this District walkthrough is structured by questline (Note: Questline is considered the entire task list that is required under a certain title. For example Away We Go Pt. 1, Pt. 2 etc). This should help you keep track of what comes next in each questline & what you’ll need to do. Keep in mind, with this game various quests/tasks can be running at once. You can be in the middle of 1 questline and another questline will start, however the order in which the questlines appear may be different for each game. Olivia is the only character released in this District, but unlocking her will take a LOT of patience…and a ton of Time Travel! So be patient in unlocking that Plutonium….. Tagged Family Guy Game, Family Guy Tapped Out, Family Guy The Quest For Stuff, Fine Arts District, Fine Arts Walkthrough, How Do I Get Plutonium for Time Travel, How Do I Time Travel, How Do I Unlock Olivia in TQFS?, Time Travel, Time Travel Blimp, What task comes next in Family Guy Game? We last left off our walkthrough we had unlocked Dr. Hartman and Brian (oh those bones!). 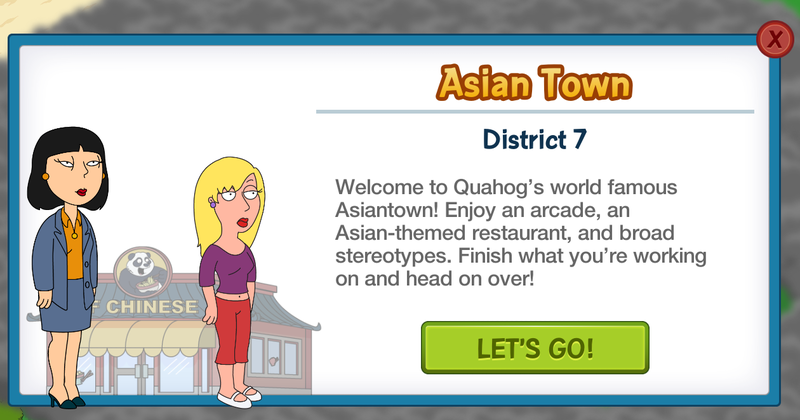 Now we’re prompted by Brian suggesting he knows where Stewie is, but to get there we’ll have to go through Asiantown (District 7). So now we pick this back up with part 1 of the quests that will pop up for you while in Asiantown! Asiantown is where you’ll unlock Connie & Tricia, two characters that have appeared locked in the game since it started. Well now we’ll finally see what they can do! Once again this District walkthrough is structured by questline (Note: Questline is considered the entire task list that is required under a certain title. For example One Hot Mama Pt. 1, Pt. 2 etc). This should help you keep track of what comes next in each questline & what you’ll need to do. Keep in mind, with this game various quests/tasks can be running at once. You can be in the middle of 1 questline and another questline will start, however the order in which the questlines appear may be different for each game. Unlocking characters in Asaintown will take a lot of patience, as the list of “Stuff” required to unlock is longer, and the quantities of each are greater. Take your time, try not to get frustrated when the items don’t appear. Try a different task to unlock the item, or try working on a different item. So let’s pick our walkthrough back up with Lois, Connie, Tricia & a whole new District to explore! Tagged Anime Peter, asiantown walkthrough, Family Guy Game, Family Guy Tapped Out, Family Guy The Quest For Stuff, How do I unlock Connie in TQFS?, How Do I Unlock Trisha in TQFS?, Midlife Crisis Lois, What task comes next in Family Guy Game? We last left off our walkthrough we had unlocked Seamus and Meg (with little effort) and Peter was just suggesting we head over to the Civic Center (District 6)…because you just never know where a toothbrush might turn up! So now we pick this back up with the complete quests that will pop up while in the Civic Center! The Civic Center is where you’ll unlock Brian, Dr. Hartman & deal with a whole lotta bull! Once again this District walkthrough is structured by questline (Note: Questline is considered the entire task list that is required under a certain title. For example A Whole Lotta Bull Pt. 1, Pt. 2 etc). This should help you keep track of what comes next in each questline & what you’ll need to do. Keep in mind, with this game various quests/tasks can be running at once. You can be in the middle of 1 questline and another questline will start, however the order in which the questlines appear may be different for each game. Unlocking characters in the Civic Center takes a lot of patience, as the list of “Stuff” required to unlock is longer, and the quantities of each are greater. Take your time, try not to get frustrated when the items don’t appear. Try a different task to unlock the item, or try working on a different item. So let’s pick our walkthrough back up with Peter, a bunch of bull & the quest for NEW stuff! Tagged civic center walkthrough, Cop Joe, Family Guy Game, Family Guy Tapped Out, Family Guy The Quest For Stuff, how do i unlock brian in family guy game?, how do i unlock dr. hartman in the family guy game?, Rambo Lois, What task comes next in Family Guy Game? We last left off our walkthrough we had unlocked Mr. Herbert and Joe and Peter was just suggesting we head over to Pirate’s Cove (District 5)…because “sometimes a guy just wants to be best friends with a bird”. So now we pick this back up with the complete quests that will pop up while in Pirate’s Cove! Pirate’s Cove is where you’ll unlock Seamus, Meg & have to take down a bunch of pirates! Once again this District walkthrough is structured by questline (Note: Questline is considered the entire task list that is required under a certain title. For example A Pirate’s Life for Peter Pt. 1, Pt. 2 etc). This should help you keep track of what comes next in each questline & what you’ll need to do. Keep in mind, with this game various quests/tasks can be running at once. You can be in the middle of 1 questline and another questline will start, however the order in which the questlines appear may be different for each game. Unlocking characters in Pirate’s Cove takes a little more patience, as the list of “Stuff” required to unlock is longer, and the quantities of each are greater. Take your time, try not to get frustrated when the items don’t appear. Try a different task to unlock the item, or try working on a different item. So let’s pick our walkthrough back up with Peter, Pirates & the quest for NEW stuff! Tagged Family Guy Game, Family Guy Tapped Out, Family Guy The Quest For Stuff, How do i unlock meg in family guy game?, How do I unlock Seamus in family Guy game?, Long John Peter, Mermaid Peter, pirates cove walkthrough, What task comes next in Family Guy Game? Tagged Family Guy Game, Family Guy Tapped Out, Family Guy The Quest For Stuff, How Do I Unlock Herbert In Family Guy?, How Do I Unlock Joe in the Family Guy Game?, School District Walkthrough, What task comes next in Family Guy Game? We last left off our walkthrough we had completed the quests from the start of the game & unlocking Clam Quarter, and Peter was just suggesting we unlock the Shopping District (District 3)! So now we pick this back up with the complete quests that will pop up while in the Shopping District! The Shopping District is where you’ll unlock Mort, Lois & Al Harrington’s. By unlocking Al Harrington’s you’ll be able to start to build costumes and unlock more skins (& tasks) for your characters! I tired to run this one a little bit differently than the first walkthrough & sort it via the questline, instead of it jumping all over the place (which the game itself will do). Note: Questline is considered the entire task list that is required under a certain title. For example Dollars and Sense Pt. 1, Pt. 2 etc. This should help you keep track of what comes next in each questline & what you’ll need to do. Keep in mind, with this game various quests/tasks can be running at once. You can be in the middle of 1 questline and another questline will start, however the order in which the questlines appear may be different for each game. Unlocking characters in the Shopping District takes a little more patience, as the list of “Stuff” required to unlock is longer, and the quantities of each are greater. Take your time, try not to get frustrated when the items don’t appear. Try a different task to unlock the item, or try working on a different item. So let’s pick our walkthrough back up with Peter, Goldman’s Pharmacy & the quest for NEW stuff! Tagged Family Guy Game, Family Guy Tapped Out, Family Guy The Quest For Stuff, How do I build costumes for my characters?, How Do I Unlock Lois?, How do I unlock Mort?, Shopping District Walkthrough, What task comes next in Family Guy Game?